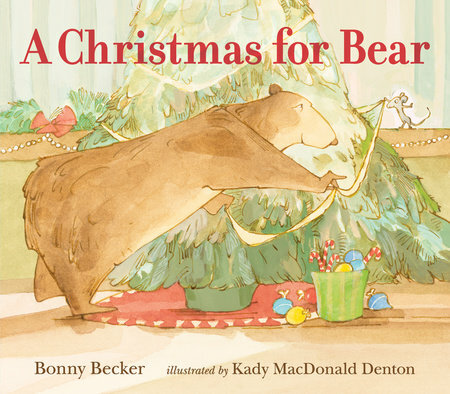 In their sixth adventure together, best friends Bear and Mouse celebrate Christmas with pickles, a poem, and presents. One frosty night, Bear hears a tap, tap, tapping on his front door. “Merry Christmas!” cries Mouse. Mouse is there for a Christmas party, and Bear has never had one before, but he’s certain that pickles (preferably from France) must be an essential component, along with the reading of a long and difficult poem. Will there be even a tiny present involved? “Hogwash!” scolds Bear. But does Bear really mean it? Soft-focus illustrations in watercolor, ink, and gouache are particularly strong in the subtle expressions on the animal faces as well as in meeting the design challenge of including a huge bear and a tiny mouse in one environment.